Pop quiz time! Which of these statements sound like you? – You are in high school or are about to begin high school. – You want to earn a college degree, but don’t want to spend years of time and thousands of dollars to achieve it. – You’ve heard of this thing called “dual credit” but aren’t sure how to get started. – You enjoy studying and want to think outside of the box to do college, but a plan would be amazing to give you a head’s start. If you answered yes to any of these questions, keep reading. Dual Credit at Home may be what you need to earn an accredited degree during high school! What is dual credit and credit by exam? Dual credit is earning high school and college credit at the same time for the same course. Many college subjects are also covered in traditional high school material. Colleges call these subjects general education requirements. They are also known as the “core” or “basic” classes that you study as part of your bachelor or associate degree. Some example subjects are math, English, history, and science. These subjects sound familiar because you are studying them in high school. Often much of the content taught in these college subjects is a repeat of what you learned in high school. Why not study the subject once, but on a deeper on a college-level, and during high school? After studying the subject, you can take a college-level exam to prove your knowledge. Passing the exam will earn you college credit by exam. Credit by exam is awarded when you pass an accredited, college-level exam, such as a CLEP or DSST exam. This proves your knowledge of the subject. A passing score on the exam can earn you the same number of credits as students who sat through a 16 week or 32-week class. But because you have not paid 16 or 32 weeks worth of tuition, you can save thousands of dollars on that course. Pass the exam and you’ll earn college credit, and this is dual credit because you are still enrolled in high school. Think of all the time and money you can save! What is Dual Credit at Home? 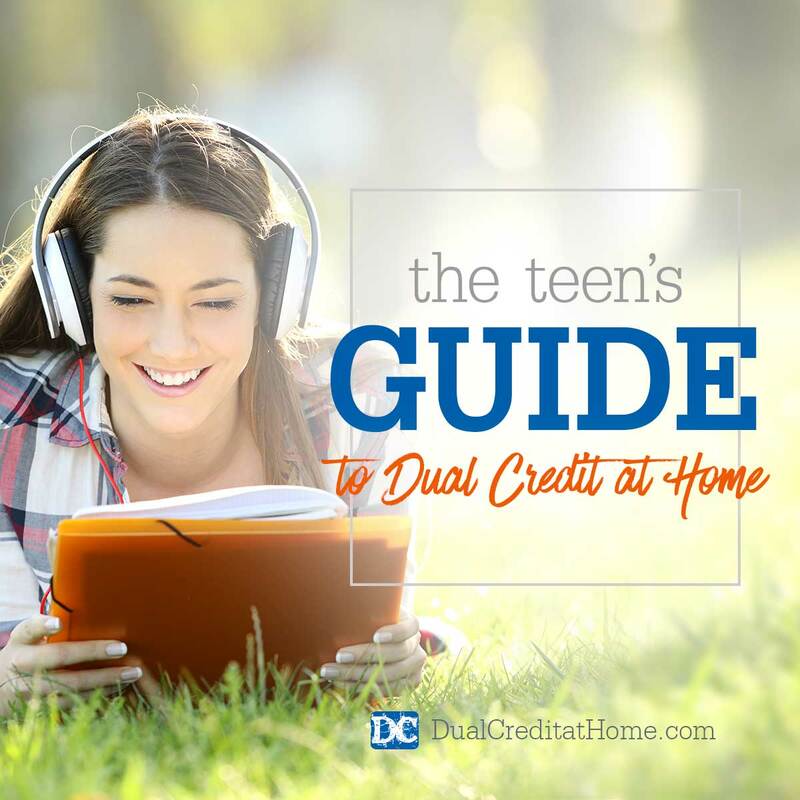 Dual Credit at Home is a program that helps teens earn college credits during high school. We help teens study high school subjects on a college-level so they can earn college credits by exam. We provide weekly Study Plans that replace traditional high school curriculum. We deliver these Study Plans straight to you or your parent’s email inbox each week. The Study Plans will tell you exactly what to study and how to study. By the time you pass the 13 CLEP & DSST exams, you can have earned up to 51 college credits. Curious to see what a Study Plan looks like? Download a sample Study Plan now. Once you finish studying a subject, you can take a multiple choice college-level exam. When you pass it, you can earn three, six or even more college credits for that subject. There are two types of exams that we recommend as part of Dual Credit at Home, CLEP exams and DSST exams. Dual Credit at Home makes it easy to know what to study and how to study for the exams. We’ll even tell you what books to buy and suggest practice tests for you to take. What does a day in the life of a Dual Credit at Home student look like? YOU decide what your school day looks like! That’s the beauty of the dual credit at home part. You only have to leave your house to take an exam, so most of your studying is at home. Or while your family is on the mission field. Or wherever your family is stationed while your parent is serving your country. Watch the video to hear one of our students, Kimberly, share about the flexibility of Dual Credit at Home. Each day’s assignments usually take about 3-4 hours of time. Many teens also study a foreign language, music, sports, drama, band, or do speech & debate. Depending on your age, you might still be studying some early level math or English material. The best way to get started is to watch our free online workshop. It’s called How to Earn a Bachelor’s Degree during High School. Invite your mom or dad to watch it with you! – We’ll give you recommendations for online accredited colleges. Your accredited bachelor’s degree can cost less than $10,000. – We’ll share more about what you can expect when you take a CLEP or DSST exam. – We’ll talk more about the exact exams that we recommend with the program. – We’ll tell you everything you need to know about enrolling in Dual Credit at Home. Plus we’ll give you a special discount that will save you even more money on your degree! Sign up today by visiting www.dualcreditathome.com/workshop. You’ll also have a chance to send us your questions while you watch the workshop. We can’t wait to help you get started on your dual credit adventure!